Topic: Is there any way to define Tier Prices via API? We are setting up a multi-store solution where each store can have custom product prices. In Admin, we are able to handle this by defining a Tier Price for each store, which is great. Topic: Product Picture: What is most common reason for "Upload failed" error message on a Linux / Docker setup? Thx for your reply (and sorry about failed image formatting above). 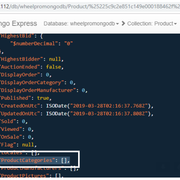 We're using MongoExpress and I have confirmed that data is not updated in the database, even if HTTP gives 200/OK. Also checked this product in the front store UI (no category assigned). 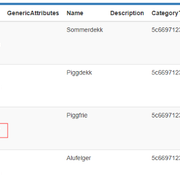 We were able to update product name for product via API, so DB connection is to be OK. There is always an explaination for issues like this. Please check what "states" could give 200/OK without updating the DB. We will try to set up the API as a local api test sandbox as mentioned, but I guess this will take some time. We are still working on the API. I have struggled with this issue for some time now and realize I might just ask for help. Problem is assigning category to product . This gives 200/OK but is not updated in MongoDB. Do you see what the problem might be? Will appreciate any help on this! Hi, thanks a lot for helping to debug this. I've been reading up on this, and it seems that both the trailing "Z" and "+01:00" are valid time formats according to ISO 8601. (Z means UTC and +01:00 means UTC plus 1 hour). What is *not* valid however, is the commas in the dates that I have tried to send. I'm not sure where/when/why the dots in my test have been replaced by commas (as in "2019-03-16T06,03,28.991Z), but it seems that dates from GN API has the correct format. Sorry for the inconvenience as this apparently is not a bug after all. OK, so we’re trying the simple solution first: Update using POST to our store API http://[OUR_DOMAIN]/odata/product , with similar JSON as received from GET. However, the POST gives a 400 Bad Request result. We have not implemented SSL yet so just using http. I have looked at the API source code and understand that the product’s Id should be specified in the JSON, and not be part of the url, and that it needs to be POST and not PUT. 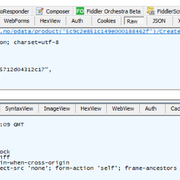 Authorization is OK using Bearer, and have checked that JSON syntax is valid. I have tried to “wrap” the JSON in different ways with curly braces and labels, but have not been able to get this to work. I’m pasting the raw request and response from Fiddler below. Any suggestions that can help us solve this are appreciated. Note: I have not included the contents of the Categories / Manufacturers arrays (etc) in the bottom in the request. What is the minimal JSON neccessary for updating a product via the API? Is the solution to load the existing product object from the API and use that for modifications? Topic: Are there any significant differences between nopC plugins and GrandNode plugins? If so, what are these differences, and which modifications would be needed in code? Example: Payment plugin is used in nopCommerce, must be able to use in GrandNode implementation.